Here it is…. Two more days to end the year 2011. I am entering the new year of 2012 with a lot of things in mind. My last day of work is officially 31 Dec 2011… That makes me no longer a teacher starting 1 Jan 2012. I’ve worked in STB-ACS for 3 years, since Jan 2009. My initial plan was to work for a year, to then quit and continuing my study. It didn’t work that way obviously. I served for another 2 years and finally half-heartedly resigned abandoning my kids while they are preparing for their exams this coming May. It’s about time…. That is the excuse that I keep repeating in my mind to justify my decision. It’s really about time. I no longer have the age advantage to start studying again. It’s now or never. I could have waited for another semester, another year. But in my heart I insisted, now or never! So I decided it’s indeed the right time. I do hope I made the right decision…. Sekolah Tiara Bangsa – ACS (International) Jakarta. Quite a long name for a school, but this is where I started my life after my graduation. This is where I met my wonderful colleagues and students. I started my working life awfully, bad enough to make me said “Call me crazy if I’m still here next year.” And I was, by my own definition, CRAZY. Three years…. Good Lord…. I’ve survived my three years of life there!!! Over 70 students, 4 different batches every year and here I am…. Looking back and thinking about everything I will miss when I start my new life next year. A friend of mine once said, “It’s not the place that you’ll miss, it’s the people.” This was proven to be the case after I graduated from NTU and I think this will again be proven to be true. 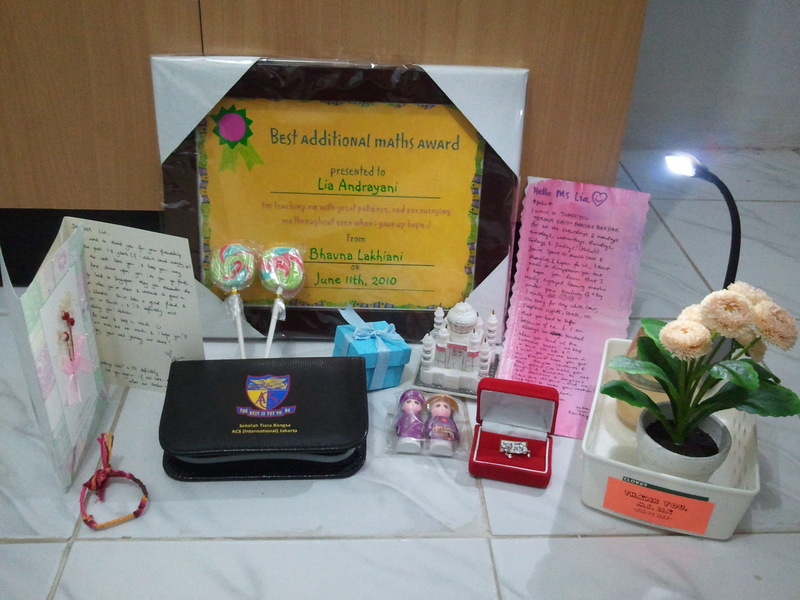 I’ll miss all of them, Bosses, Colleagues and Students…. My kids were upset when I said I won’t be there next semester. The thing they probably don’t know is the fact that it’s also very hard for me to let them go. I’ve taught some of them for the whole 3 years. I’ve been there with them, watching they grow physically and mentally, experiencing the thinnest difference between hatred and love. I’ve learned to forgive, I’ve learned to tolerate, I’ve learned that being different isn’t always bad, I’ve learned that the most beautiful thing in life is not achieved by being uniformly synchronized, but by being true to ourselves and accept whatever differences we have. We are made for each other, one to complete the other one. I bet some of my kids used to hate me, but in the end the truth will be unveiled, that like all other teachers, I wanted the best for them. My mission is accomplished when my kids do better than me. And I proudly and happily admit that some of my kids are already better than me and more to be. I have nothing to regret. I’ve done practically everything I could. I’ve been their teacher, their sister, their friend. People thought by being a teacher, we could touch young lives. But I’ve been one, and I have to say it’s indeed my life that was touched by them. A simple joke in class can make my day, a short “Hi” along the corridor can lighten up my mood, and at the end, receiving hugs from them told me one simple message, that I will definitely miss them…. Guys…. You are engraved in my heart forever. I pray that you will achieve everything best in life….